In celebration of the Faculty’s 85th Anniversary, the Graduate Studies Division organised “FASSforward! The Ultimate Research Challenge” for graduate students in FASS on 6 & 7 August. With team members and the research theme of “Forgotten Peoples, Places and Issues in Singapore” revealed only on the morning of the competition, students were challenged to: identify a group, a site or a topic that has been neglected in Singapore; demonstrate why it is important to give the topic more focus in academic research; and propose an inter-disciplinary project, including specific points/lines of enquiry, to undertake research on the group/site/issue identified. Working in multi-disciplinary teams of 4-5 members, the eleven teams came up with some excellent topics, interesting perspectives and excellent presentations in just 28 hours. Topics ranged from “overlooked” and marginalised minority groups in Singapore to spaces that have been buried in our social memories. The winning team, comprising students from Comparative Asian Studies, Communications and New Media, Geography and Malay Studies, won for their presentation on Merdeka Bridge, Singapore’s “Lost Bridge”, while the runners-up made their respective cases for “Remembering the Orang Laut” and not “burying history” by forgetting Singapore’s burial spaces. 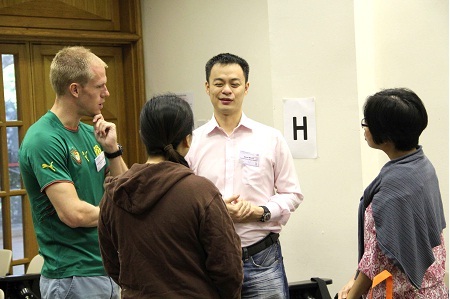 Representation from all the departments and programmes across FASS took part in the challenge. 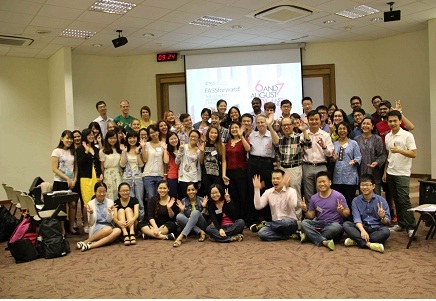 Many of the students – a good mix of new and current, coursework and research, and Masters and PhD students – shared that they had benefitted greatly from participating in the competition through making new friends, learning different approaches in conducting research, and finding out many (new) things about Singapore. Professors David Taylor and Vineeta Sinha, two of the judges of “FASSforward!”, echoed the thoughts of the students when they voiced the hope that the competition will “become a part of the annual calendar of events in the Faculty”. The Graduate Studies Division would like to thank all colleagues and students who contributed to making the event a success. The competitors, with Deanery members and FASSforward Resource Persons, at the start of the competition. Team H, the eventual winners, in discussion.